Kokilaben Ambani, mother of Anil and Mukesh Ambani and widow of Reliance founder Dhirubhai Ambani, in a statement said that she was amicably resolved the issues between her sons. "With the blessings of Srinathji, I have today amicably resolved the issues between my two sons, Mukesh and Anil, keeping in mind the proud legacy of my husband, Dhirubhai Ambani." 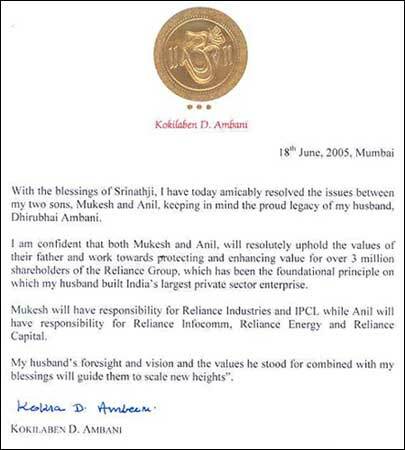 "I am confident that both Mukesh and Anil will resolutely uphold the values of their father and work towards protecting and enhancing the value of over 3 million shareholders of the Reliance Group which has been the foundational principle on which my husband built India's largest private sector enterprise." "Mukesh will have responsibility for Reliance Industries and IPCL, while Anil will have responsibility for Reliance Infocomm, Reliance Energy and Reliance Capital." "My husband's foresight and vision and the values he stood for combined with my blessings will guide them to scale new heights." Sub: Mrs K Ambanis letter.